At the end of Burrard Inlet, just a forty minute drive east of Vancouver, you will find a small community with an abundance of picturesque natural beauty. It is known as Port Moody. Port Moody is a gorgeous protected harbour nestled at the foot of Eagle Mountain. While the forested parklands standing above the community boast abundant opportunities for hiking and serve as home to breathtaking mountain views and glistening lakes, Port Moody itself affords residents and visitors alike, with ample boating and kayaking opportunities. Additional outdoor recreation options include those found at Buntzen Lake Recreation Area, Civic Centre Complex and Belcarra Regional Park. 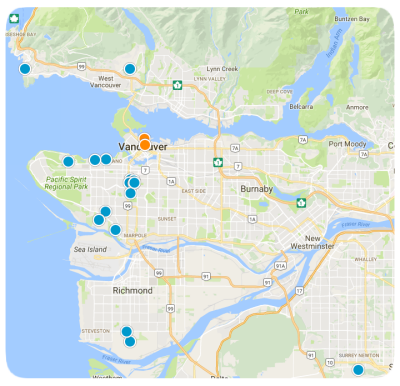 One of Metro Vancouver’s fastest growing suburbs is the Tri-City region which is comprised of Coquitlam, Port Coquitlam and Port Moody, the smallest of the three. Buy a home in Port Moody and enjoy all the first-class amenities and features of this large and growing region, while simultaneously basking in the laid-back lifestyle of this remarkable small community. In addition to these great features and amenities, Port Moody also has a long history and rich cultural heritage. As a result, the community is home to the Station Museum and hosts festivals like Golden Spike Days, among others. Today Port Moody’s heritage continues to be a part of the lifestyle and you will find freighters slowly coming and going in the sheltered harbour. Also in the harbour you’ll find osprey, eagles and sea lions alongside kayakers making the trip up Indian Arm and Burrard Inlet. Residents of Port Moody also enjoy great opportunities for shopping and dining. Newport Village is the walkable commercial hub of the community, designed like a miniature Whistler Village. It incorporates multiple hi-rises and includes specialty retailers, ethnic restaurants, and shops with baked good, gifts and fresh produce. With all of these extraordinary amenities, Port Moody is a must-consider destination for homebuyers. Homes for sale in Port Moody are found in several alluring neighbourhoods including the Village of Belcarra and neighbouring Anmore. With land and real estate values on the rise, now is a great time to purchase property in Port Moody. If you would like more information regarding homes for sale in Port Moody of the Greater Vancouver area, please contact us today.